Metal roofing is sometimes viewed as a little old fashioned with images of rustic, ridged and sometimes, even rusted roofs. But, there has been leaps and bounds of improvements and innovation in materials, design and repair technologies for metal roofing that make it architecturally appealing and durable, making it a great choice for building owners and managers. Depending on the particular needs of your building, there are now many great options to choose from. They can give your property a sleek modern look using recyclable materials like steel, copper and aluminum, even looking like shingles if you like. There are, however, some things you need to know about commercial metal roofing before you make the choice of installing it or replacing the current roof on your property. They aren’t perfect, but its relatively easy to avoid their few pitfalls. Can be Slick to Walk On – You’ll need to be cautious if you go up on the roof, but this is a trait that can be a positive because rain and snow easily sheds off of it. However, with some designs, they can be textured to look like shingles and other types of material so they look great and also help with the slickness factor. Can be Dented – Some materials will give you warranties against denting or even footprints showing on it, but many can be affected and dented by hail storms. Can be Loud During Storms – during heavy rainfall or hail, the sound can be quite loud. But, there are options to choose from, with sheathing and sound insulation that can help lesson the sound. Initially Costs More – commercial metal roofing is not inexpensive, in fact its more expensive than other types of roofing systems to initially install, but, due to its longer lifespan and low maintenance requirements it will give you a better ROI over time than the others. Longer Lifespans – as we’ve mentioned, metal roofing’s durability is one of its biggest advantages. Many times, they will come with warranties that are as long as 40 to 50 years, sometimes lasting longer than the building itself. Compared to other roofing systems they are lighter in weight, allowing them to be installed faster and putting less stress on your building’s structure. You can even install metal roofing over your property’s existing roofing system, which reduces the amount of time needed, since you don’t have to tear off and remove the existing one. Energy Efficiency – You will save significant amounts on your utility bills due to the way it reflects heat and sunlight away from the roof. There should be a gap between the roofing structure itself and the exterior surface, even though insulation does not have to be used with metal roofing. They redirect heat back into your building in winter months when this gap provides ventilation and interior thermal reflection. Seal Out Water Better – As we mentioned before, snow and rain will flow off the metal roof more easily than other materials with its slick surface, so it works rally well for sealing out moisture. Fire Resistance – You will save money on insurance premiums due to metal roofing’s resistance to heat and fire. The only thing that might negate this is if you install it over an existing roof that has flammables like wood shakes. A misconception of metal roofs is that they are more prone to lightning strikes due to their materials, but that is simply not true. No matter what your roof is made of, lightning will strike at its high point. If this is something you’re concerned about, a lightning rod would be worth looking in to. Extreme Weather Protection – metal roofing stands up well to mother nature due to its sturdy construction. No matter what she throws at your property – pouring rain, extreme wind, blazing hot sun or even insect infestation – it holds up well all year long. If installed correctly and galvanized, it’s also more rust and rot proof than other roofing systems. 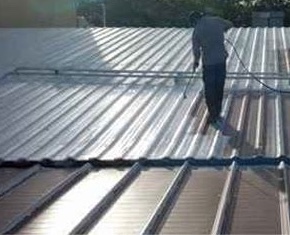 Taurus Elite Commercial Roof Systems 512-332-4422 provides commercial metal roofing services to Austin, Texas and the surrounding area, including Cedar Park. This includes commercial metal roof repair, commercial metal roof restoration, commercial metal roof replacement and commercial metal roof installation. We have been providing professional commercial roofing services to the area for over 20 years. When you need advice about a metal roof repair for your commercial property, call us, the number one authority for metal roofing in Texas.